This is a Junsi Electronics iCharger 106B+ DC Battery Charger. This charger allows you to charge and balance 2S to 6S lithium batteries. The charger comes with XH style balance connectors on the side of the charger that fit Align, E-Flite and ProTek R/C battery packs. Adapter boards for other batteries are also available. Two input power choices. DC jack with auto-resetting fuse (maximum input current 6A) and alligator clips that can be soldered the the main input leads (25A).The output power can be adjusted to align with the available input power, thus preventing input current overload and protecting the DC source. Multiple Battery Types. 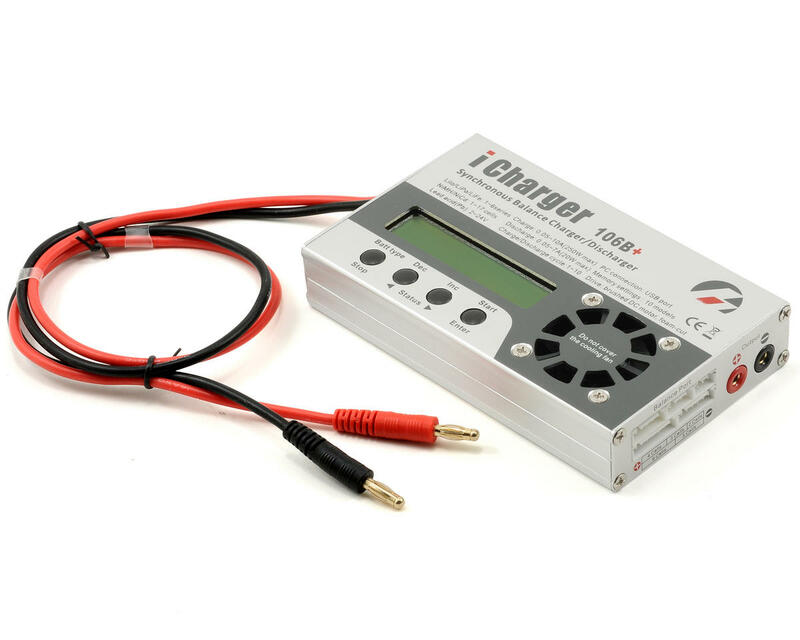 The iCharger series can be used with three types of Lithium batteries - LiPo, Lilo, LiFe - and has a fully integrated cell balancer. Temperature Sensor. Internal temperature sensor and temperature controlled automatic cooling FAN controls the internal temperature and provides intelligent protection. When the internal temperature is over 60℃ (140°F), the output power is automatically reduced by 25%. If the temperature exceeds 65℃ (149°F) the charge cycle is stopped. 10 memory slots. Convenient set of 10 battery profile memories that can be saved and loaded by number. You can also set the name on the memory slots to a custom value for easy identification. Large backlit LCD screen. 2x16 backlit LCD screen that provides rich information including active mode, current, voltage, total charge (mAh), charging time and temperature etc. Charge/Discharge options. Various charging/discharging settings and cycles to meet a wide range of customer needs. For Lithium batteries: balance charging, normal charging, fast charging, storage, discharging, ext-discharging, charge/discharge cycling, and battery monitoring. For NiCd/NiMH batteries: charging-auto, charging-manual, discharging, charge/discharge cycling and forming charge. For Pb batteries: charging and discharging. Electric motor test mode. Electric motor test mode can be used to run-in electric motors, test motor parameters and performance, check tolerances etc. The iCharger also supports the “Open Format” data of the “logview” software and can display, plot and analyze the charge and discharge data by it. 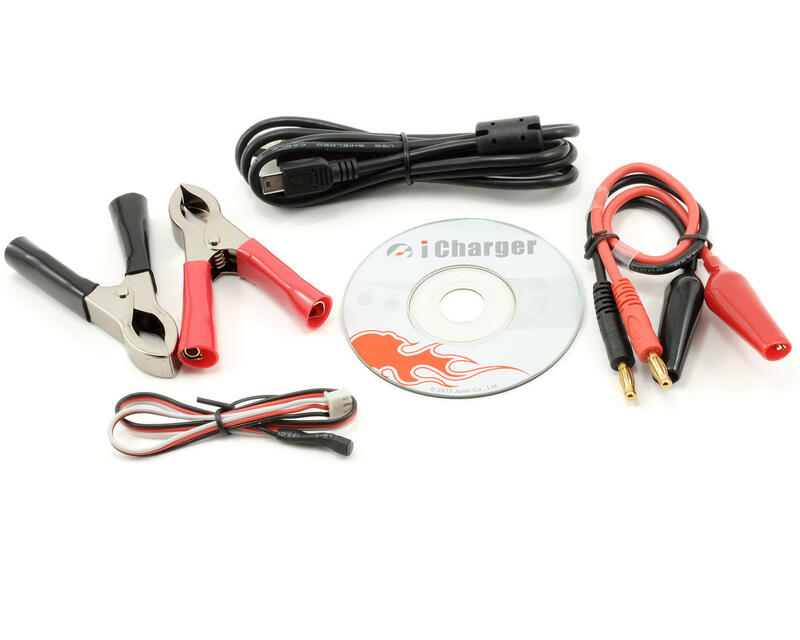 (See detail information about logview in the following website, http://www.logview.info) The software for updating the charger via the USB port is available here, and the instructions are available here. NOTE: This charger requires a 12V power source. Been using i-chargers for years. These are reliable chargers. The fact you destroyed 2 in such a short time, means you were doing something wrong. Don't cheap out on a charger. Junsi makes quality products and this charger has been working great for charging mainly 2s and 3s batteries using a parallel charging board. Great Charger, I charge mostly 6s battery's with this charger, does great. Has good internal discharge and if you are hooked up to a car battery its great. IDK why some people are having problems. RE: overcharging issue - had same issue with 208B but it turned out to be the power supply I was using. Amain was nice enough to replace the charger beyond the normal return period. Again worked good for a few weeks, suddenly started to come up short on charges, now it goes until the over volt allarm goes off, it ends up going to 4.29 VPC. I guess I'll have to try a voltz.